Shri. 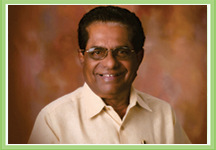 Jagannath B. Shetty is a pioneer in the business of restaurants in Pune. He has established the immensely popular trinity Vaishali, Roopali and Amrapali. He came to Pune 58 years ago to join his maternal uncle Late Shridhar Shetty in his hotel business. He was born on 8th October 1932 in Onimajalu mane in Bailur,a small village near karkalla in south kanara. Jagannath Shetty left home at the age of thirteen to work in kalyan with his uncle for Rs, 3 a month. The ambitious young boy then came to Pune in 1949 at the age of 17.The teen-aged Jagannath, worked hard from the early hours of the morning till late night. This hard work bore fruit when he started Café Madras (present day Roopali) in 1951 and later Madras Health home, now the very ‘in’ place, Vaishali. But everything was not a bed of roses and Jagannath Shetty had to work hard to achieve that success. Vaishali in those days was a tiny restaurant. However, Jagannath Shetty’s toil brought rich dividends. His restaurants as they are now, are products of nineteen hours of continuous work everyday, for a span of twenty years. Today his restaurants have become household name in Pune and are popular spots for both the young and the old alike. Celebrities frequently visit these restaurants. He has several awards to his credit. He was awarded ‘The Gunduraj Shetty gold medal for the best social worker’ for his selfless contribution to the society. Continuously he has bagged the ‘Cleanest kitchen award’ from the Pune Municipal Corporation for several years now .For the significant work in the field of quality, The Entrepreneurs International Conferred ‘Quality Award ’ to his restaurant Vaishali, on 29th July 2003.Tridal Pune Felicitated him with Pune’s most prestigious award “ Punya Bhushan Puraskar’ in the year 2000. Recently The Times Group has declared VAISHALI as the Best South Indian Restaurant. Chimanlal Govinddas Memorial Trust has also awarded him with “Udyam Gaurav Purskar”. Dowry is a social evil prevailing in our community. J. B. Shetty instituted gold medals to newly married outstanding couple i.e. those who marry without accepting ‘Dowry’. Once a year all the Bunts in Pune gather for their annual day, where a renowned member of the community is invited as the chief guest.. The guest then bestows the medal to the deserving couple. This is indeed an honor for the couple. In this way Jagannath Shetty encourages the men in Pune to oppose dowry. He has also helped many parents to get their daughters married. Though he has settled down in Pune, he has not forgotten his native place. he has generously given donations to his old school for development, and build the village Ganapathi Temple. Jagannath Shetty is an ardent golfer and has Captained Poona golf club in the year 1997-98”If I don’t play golf even for one day, I feel very uneasy”,says J.B Shetty. He has won several awards too. He has started an annual “Vaishali Cup” for amateurs. He has traveled widely all over the world .in all his social activities he had the fullest co-operation of his better half late Smt. Shakuntala Shetty. They have a daughter Kum. Nikita. There must be something intrinsically astounding in an individual who has achieved such heights without the benefit of either an academic or technical education. He deserves full appreciation from one and all.